Club Roller Hockey traveled to Feasterville, Pennsylvania on Saturday, November 18th and Sunday, November 19th. The Division 2 team went 2-1-1 on the weekend (2-1 in conference play), highlighted by a 5-1 victory over #9 ranked rival Stony Brook. The Division 2 team finished off the semester in the final playoff spot, with a 7-5-1 record and ranked #15 in the nation. Nigel Grove finished the first half of the season leading the league in points (37) and assists (22). Andrew Gagnon finished fourth in points (32) and third in assists (20). Colin Ewald finished second in points (35) and fourth in goals (19). Club Women's Rugby traveled to Seakonk, Massachusetts on Sunday, November 19th to compete in the Cianci 7's Tournament. The Pride fielded two teams for the 7's tournament. The first squad had a tremendous day and came in 2nd place overall. The Pride won 22-0 against Northeastern, 15-5 against Stony Brook, 36-10 against Salve Regina and 22-17 against Siena. The Pride's second team participated in their first ever 7's tournament and had tremendous improvement throughout the day. Tries were scored by Samantha Dickie, Lili Hinojos-Madrid, Ashley Higby, Raksha Bushan, Sophie Kabel and Dagny Arnardottir. 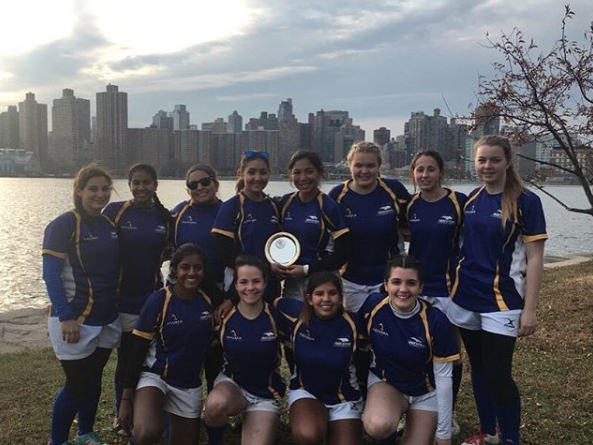 The Pride came away with some hardware after their solid performance at the Women's Collegiate 7's Tournament on Randall's Island, New York on Saturday, November 25th. PC: @huwrfc via Instagram. On Saturday, November 25th, the Pride competed in the Women's Collegiate 7's Tournament on Randall's Island in New York City. The team came in 3rd place overall and took home the bronze plate with wins against Stony Brook and the Royal Military College of Canada. Club Billiards held their weekly match on Sunday, November 19th at Raxx Pool Hall in West Hempstead, New York. Hofstra came away with the win by a score of 12-0. Kevin Gomes and Victoria Wetmore notched shutout victories, while T.J. Murphy, Hammad Imran and Colin McGuire all posted wins. The Pride were back in action on Sunday, November 26th at Baldwin Billiards in Baldwin, New York. Competing against the first-place team, Hofstra came away with a 9-4 victory. Jorge Contreras and Timothy Murphy both scored shutout victories to provide the team with momentum as they head towards the playoffs. Club Men's Ultimate arrived in Princeton, New Jersey on Saturday, November 18th to compete in the Northeast Championship. The Pride went 3-0 on their first day of play beating Rutgers, 13-6, Swarthmore, 13-10, and Stephens Tech, 13-11. Despite the positive momentum, Hofstra would drop matches two matches on Day Two of the event and ultimately finish in 4th place overall. Club Women's Volleyball competed at Sportime in Bethpage, New York on Saturday, November 18th. The team battled their way through pool play and the semi-finals before dropping a close match in the finals. Lori led the Pride in digs and service runs at the team’s tournament at Sportime Bethpage. Her high volleyball IQ was on full display as she was able to place the ball with pinpoint control. Engler’s excellent play helped lead Hofstra to a 2nd place finish in the tournament. Congratulations to Lori!